portance of optimism and the appearance of burnout syndrome. (Happell & Koehn, 2011) or health (Sánchez & Méndez, 2007). timism, as we show later in this paper. Hardy, 2005; Remor, Amorós, & Carrobles, 2006). tions that subjects have for the events that can happen to them. traits (Ferrando, Chico, & Tous, 2002). 2003; Seligman, Nolen-Hoeksema, Thornton, & Thornton, 1990). times from the first situation. 2002; Nicholls, Polman, Levy, & Backhouse, 2007). ing as aspects of burnout. chologists utilize to assess the presence of burnout in athletes. drade, Arce and Raedeke (2009). & Garcés de los Fayos, 2002). relationship between optimism and burnout in any context. relationship between optimism and reduced efficacy. ceived stress, burnout, and optimism. a range from 15 to 31 years. A simple sampling was carried out. 87% of participants in the competition. applicable inventory to the athletes population. tic-pessimistic tendency of the athlete, the criteria of Ortín et al. SPSS Inc., Chicago, IL, USA). 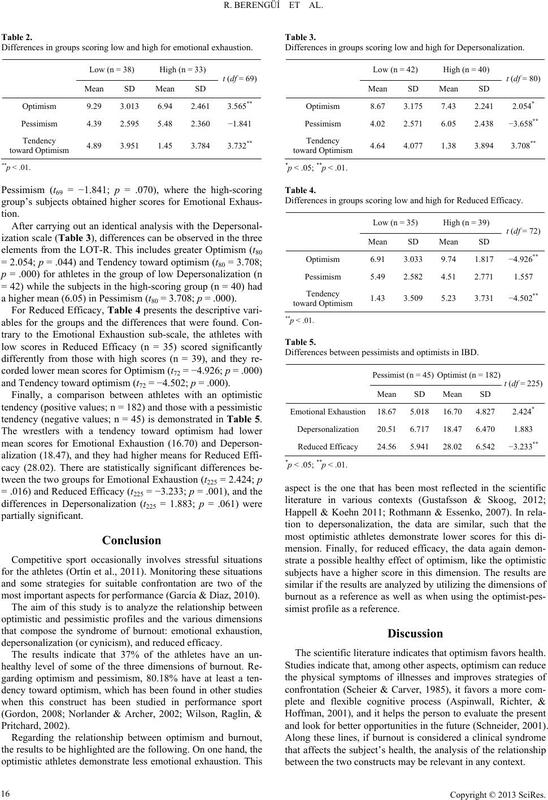 tion, and 27 had values above 66% for Reduced Efficacy. scored high on all three scales. Differences in groups scoring low and high for emotional exhaustion. a higher mean (6.05) in Pessimism (t80 = 3.708; p = .000). and Tendency toward optimism (t72 = −4.502; p = .000). tendency (negative values; n = 45) is demonstrated in Table 5.
most important aspects for performance (García & Díaz, 2010). depersonalization (or cynicism), and reduced efficacy. Differences in groups scoring low and high for Depersonalization. *p < .05; **p < .01. Differences in groups scoring low and high for Reduced Efficacy. Differences between pessimists and optimists in IBD. simist profile as a reference. The scientific literature indicates that optimism favors health. and look for better opportunities in the future (Schneider, 2001). between the two constructs may be relevant in any context. ment, and correct attributions may positively affect the athletes. given to the athletes (Ortín et al., 2012). 238). Washington DC: American Psychological Association. deporte. Conceptos y a p l icaciones. Madrid: Morata. failure or social problem. Sociology of Sport Journal, 9, 271-285.
ciones (6th ed.). Madrid: Editorial Médica Panamericana. Cunha, G., Mesquita, I., Moreno, P., Boleto, A., Tavares, T., & Silva, P.
dernos de Psicología del De po r t e, 10, 23-36. De Francisco, C., Arce, C., Andrade, E., Arce, I., & Raedeke, T. (2009). Psicología del Deporte, 9, 45-56. De la Vega, R., Ruiz, R., Batista, F., Ortín, F. J., & Giesenow, C. (2012). lete’s optimistic profile. Psychology, 3, 1208-1214.
un sistema de evaluación e intervención i n te g ra l. Madrid: EOS. formació Psicológica, 91- 92, 12-22.
stión. Apuntes de Psicología, 2 8, 213-224.
athletes. Anxiety, Stress and Coping, 25, 183-199.
vorship. Psycholog y , 3, 1238-1242.
during preparations for the 1999 women’s soccer world cup finals. The Sport Psychologist, 16, 251-271. López-López, I., Jaenes-Sánchez, J. C., & Cárdenas-Vélez, D. (2013). (CPRD). Cuadernos de Psicología del D epo rt e, 13, 21-30. Martin-Krumm, C. P., Sarrazin, P. G., Peterson, C., & Famose, J. P.
ity and Individual Differences, 35, 1685-1695. Maruta, T., Colligan, R. C., Malinchoc, M., & Offord, K. P. (2000). 30-year period. Clinic Proceedings, 75, 140-143. Maslach, C., & Jackson, S. E. (1981). MBI: Maslach burnout inventory. Mroczek, D. K., Spiro III, A., Aldwin, C. M., Ozer, D. J., & Bosse, R.
anxiety. Personality and Individual Differences, 27, 1.261-1.272. Nicholls, R. A., Polman, C. J. R., Levy, A. R., & Backhouse, S. H.
athletes. Pers onality and Individual Differences, 44, 1182-1192.
dispositional optimism. 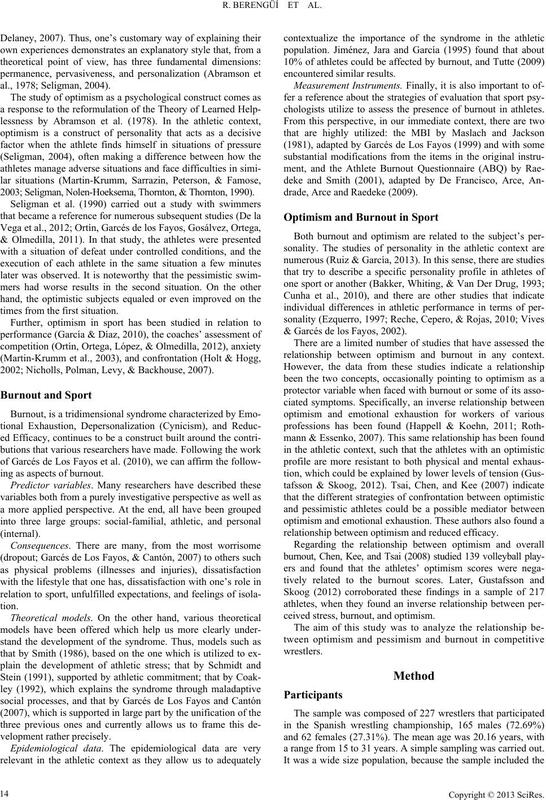 Perceptual and Moto r S k i lls, 94, 153-164.
de la competición deportiva. Anales de Psicología, 28, 233-239. Otero, J. M., Luengo, A., Romero, F., Gómez, J. A., & Catro, C. (1998). nacional español. Cuadernos de Psicologia del Deporte, 10, 33-42.
tice. 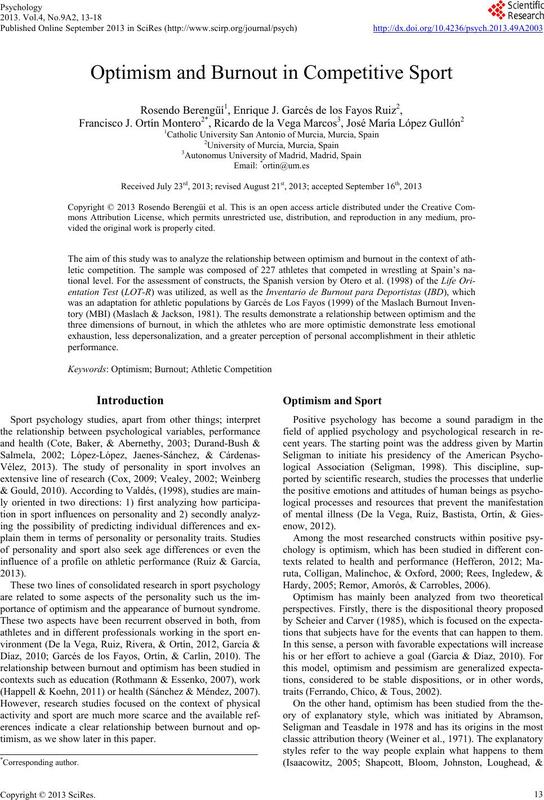 Psychology of Sport and Exercise, 6 , 189-204.
deportivo en jugadores de fútbol desde el modelo de Costa y McCrae. Anales de Psicología, 13. In press. Sanjuán, P., Pérez-García, A. M., Rueda, B., & Ruiz, M. A. (2008). sonality and Social P sychology, 67, 1063-1078. 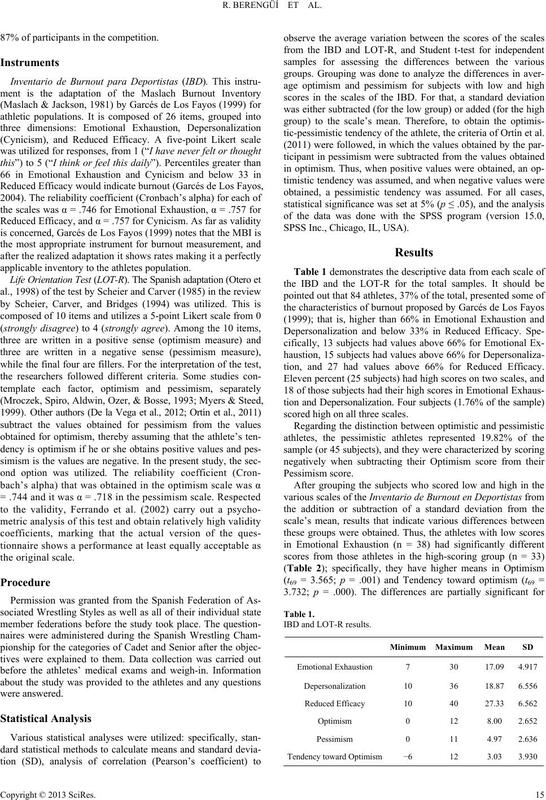 Assessment and implication of generalized outcome expectancies. Seligman, M. E. P. (2004). Aprenda optimismo. Madrid: Debolsillo. Seligman, M. E. P., Nolen-Hoeksema, S., Thornton, N., & Thornton, K.
letic performance. Ps ychological Science, 1, 143-146.
practice: A review for combined benefits. 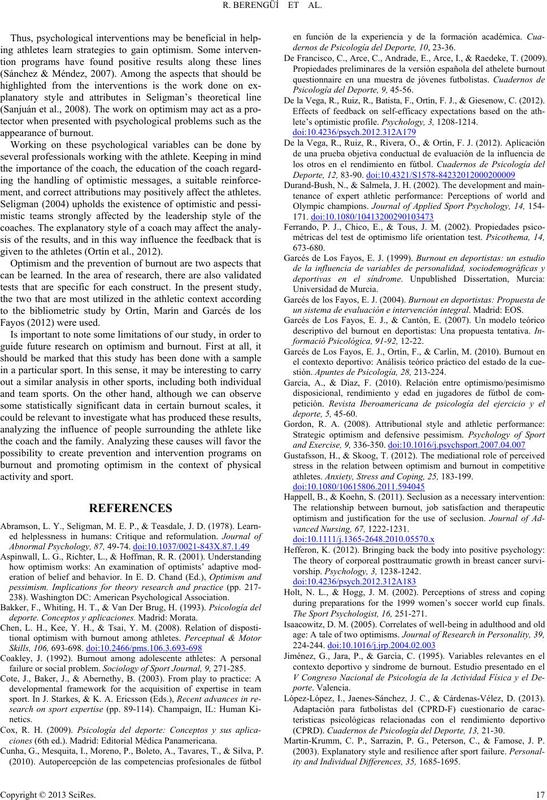 Psycho log y, 3, 1110-1115.
outcomes in sport. Neuro Rehabilita t ion, 22, 161-167.
burnout. 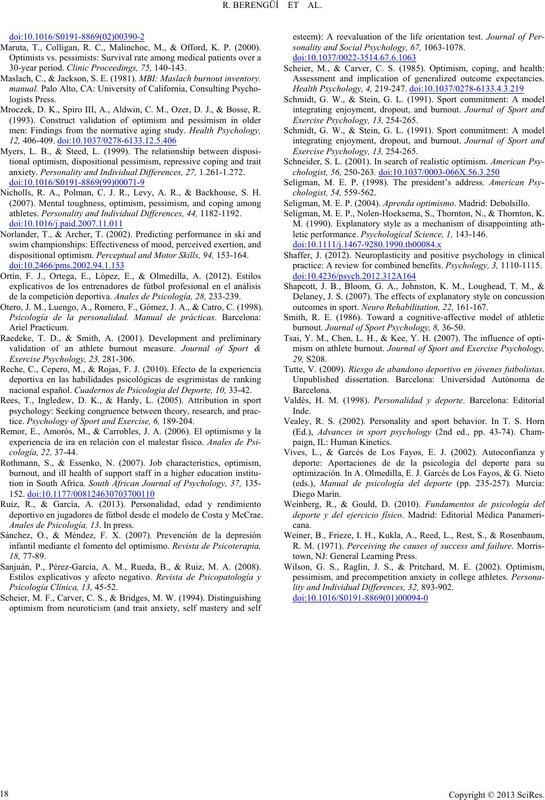 Journal of Sport Psychology, 8, 36-50. Tutte, V. (2009). Riesgo de abandono deportivo en jóvenes futbolistas. town, NJ: General Learning Press. lity and Individual Differences, 32, 893-902.